The latest on the 2010 Pageant here or go to 'cuttings' and 'images' to see images , cuttings & videos. 11/03/11 - Axbridge Pageant Association distributed grants to a few Axbridge causes; Axbridge Town Trust, Axbridge & District Museum Trust (King Johns Hunting Lodge) & Friends of Axbridge Church. 08/03/11 - The 2010 pageant committee was disbanded & re-constituted as Axbridge Pageant Association, a permanent organisation for the management of the pageant & it's assets. John Kendall took on the role of Chairman of this organisation. 27/02/11 - at Axbridge's re-instated Civic Service, to celebrate those who contribute to our community, Jackie Fowler was recognized for her contribution to Axbridge Pageant, as head of costumes. 26/02/11 - The Pageant costumes were returned to Axbridge, after storage in Highbridge. They will remain in Axbridge until the next pageant, under the watchful eye of John Kendall. 30/08/10 - Again the Pageant performance received a standing ovation. The glorious weather made for a spectacular day. 29/08/10 - Singing in The Square, an event with 4 popular local choirs was a SELL-OUT! The organisers were pleased with the great success of this event. 29/08/10 - Sunday's Pageant performance received a standing ovation. Artistic Director John Bailey was delighted. BBC Points West covered this wonderfull event & did justice to the key players in its success. 28/08/10 - Sheelangig entertained a 300+ strong audience in the open air. Revellers danced the night away. 28/08/10 - Harry Mottram tells BBC Somerset's Simon Parker - Breakfast show audience all about the magical pageant. The first of the 2010 Pageant performances goes off without a hitch & received a standing ovation. 27/08/10 - approximately 200 people enjoyed Bristol Brass Consort, in St.John the Baptist church in Axbridge. This is the first of the pageant evening events. 27/08/10 - The seating for the weekends performances are erected & the sand is distributed onto the ground to remove any trace of moderen roadway. It looks very time neutral. The banners decorating the Square are now complete. 26/08/10 - The stage is erected on the north side of the Square. 25/08/10 - The Pageant is now sold out. 23/08/10 - The Square starts to take shape with the first of the pageant flags being flown. August 2010 - various press articles in Cheddar Valley Gazette, Mendip Times, Weston Mercury, Western Daily Press & BBC Somerset radio interviews. 26/07/10 - Pageant Photo CD/DVD on sale. Pre-orders now & deliveries during September 2010. 25/07/10 - The Pageant agree with King Johns Hunting Lodge Trustee, John Page to do 'Walking Tours' of Axbridge & to allow small groups of people access to original historic Axbridge Documents, some that date back to 1229! 24/07/10 - Local band 'The Stopcocks' played a brilliant set at The Lamb as a fundraiser for Axbridge pageant. A great band, a great pub, a great night! 22/07/10 - Somerset Life publishes a double spread feature on the Axbridge Pageant - including breathtaking photos by Geoff Dunlop. 18/07/10 - With 5 weeks to go, Axbridge Pageant has sold 50% of tickets for Sunday 29th August. This is a new high for the pageant. The pageant team urge those who need to have tickets for a particular day to buy now, as the level of interest is surging & tickets are going fast! It is on course to be a sellout by mid August! 17/07/10 - Axbridge Fun Day, run by Axbridge Sports & Social committee, was afabulous event & saw the fisrst airing ot the Pageant Programme. Due to the size, not all advertisers were able to get inclusion. This is certainly the classiest programme ever. Without the successful branding, by SoreThumb, the pageant wouldn't have seen such great success. 12/07/10 - Ticket sales have reached breakthrough! There are 30%+ tickets sold, with 6 weeks to go! This is much better than was hoped for & much earlier than in 2000! 03/07/10 - the Ax Factor auditions, in the Oak House, wasgreat fun & a good success. There was one dubious act that appeared to be too familiar to the judges. A very successful "Order among ChAoS" won't be able to perform on the 7th - the finals of the Ax Factor. The judges were dismayed! 03/07/10 - the pageant fundraiser, organised by the Axbridge Chamber of Commerce at The Parsonage was well attended. The weather was brilliant! Much better than previous years... Thanks to Pat Filer for hosting this event for the pageant. 16/06/2010 - The pageant gets its licence to perform & close the streets. All systems are go! 06/06/2010 - Rehearsals for the 2010 pageant begin in earnest. The Town Hall was host to the first rehearsals for the 2010 pageant. The costume team were on hand to take measurements. All rehearsals will take place in the Town Hall, with the exception fo the Dress Rehearsal on Sunday 22nd August. This will take place in The Square. All we ask is that people turn up 10 mins before the allotted time so that rehearsal take place on time. 06/06/2010 - The Auction & Grand Raffle held at the Oakhouse Hotel on Saturday 5th June was a great success. The joint event raised over £2000 for the pageant. 24/05/2010 - Bristol Water announce significant sponsorship of the Axbridge Pageant. 19/05/2010 - "This England" published an article on the Axbridge Pageant. Their subscription only quarterly magazine captures the essence of England. Go online & ask for a complimentary copy. 13/05/2010 - Cheddar Valley Gazette report that a lone Dane from the past came to Axbridge to promote the Axbridge Pageant on the August Bank Holiday weekend. 16/05/2010 - Butcome Brewery join the growing list of sponsors for the 2010 Axbridge Pageant Festival. Thanks to Alan & Sany Currie at The Lamb for their support. 05/05/2010 - Ali Vincent generously contributed some previously unseen cuttings from previous pageants, including the 1967 & 1970 events. 09/05/2010 - The fantastic, Axbridge based, Stopcocks filled the Oakhouse Hotel on the 8th May & raised £294 in conjunction with our sponsors - The Oakhouse Hotel. They are rumoured to return on the 24th July. If you missed them this time then get in early next time. 29/04/2010 - Weston & Somerset Mercury - report on the success of the fundraising event held at "The Parsonage" B&B in Axbridge. 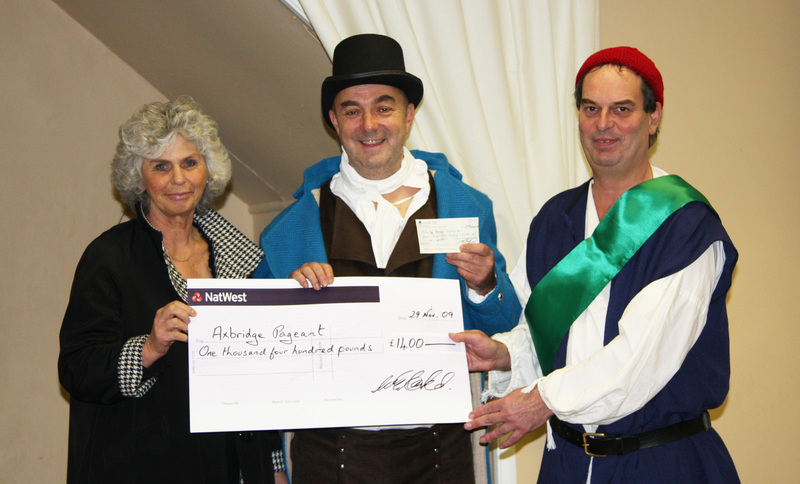 This successful Wine & Cheese Evening raised £312 for the 2010 Axbridge Pageant Festival. 29/04/2010 - Cheddar Valley Gazette - report on our successful Wine & Cheese evening hosted by Pat Filer of "The Parsonage" B&B. Thevent raided more than £300 for the pageant. 29/04/2010 - Cheddar Valley Gazette - report news of forthcoming fundraiser - The Stopcocks, at The Oakhouse Hotel on 8th May. 18/04/2010 - Tickets for the Pageant Festival Events go on sale, online. Be quick! 12/04/2010 - The first of the Pageant flyers are distributed across Axbridge & can be picked up in Tourist Information Centres & Libraries. 02/04/2010 - Catch This report that tickets for the Pageant Events have gone on sale, both online & via our Box Office. 30/03/2010 - The Oakhouse host the first batch of the exclusive Pageant Ale, brewed by the renowned Cheddar Ales. The Pageant's Principal Sponsor, The Oakhouse Hotel is the sole supplier of this tasty brew. Worth a stop to taste this excellent brew! 25/03/2010 - Cheddar Valley Gazette run a story asking for a local person to manage the Advertising Sales for our program. 12/03/2010 - The Fundrariser this evening was a massive success, despite the last minute location change. Some £450 was raised. 11/03/2010 - The 'Evening of Elegance & Fun' has been moved to the Town Hall at short notice. The organisers apologise for this change of location. 09/03/2010 - Jan Rance, Press Officer for the 1980 & 1990 Axbridge Pageant gave historic cuttings from the press of the day to the current Marketing team. 04/03/2010 - Cheddar Valley Gazette - ran an article outlining the 'Evening of Elegance & Fun' fundraiser. 04/03/2010 - Weston & Somerset Mercury ran a story 'Boost for Pageant' citing The Oak House Hotel's position as Principal Sponsor. 03/03/2010 - Catch This published an article about the Principal Sponsor for the Pageant. 25/02/2010 - Cheddar Valley Gazette - ran a pricture story about the appointment of The Oak House as Principal Sponsor of Axbridge Pageant. 01/03/2010 The large task of casting the Pageant is in progress, though taking longer than expected. Chris Jarman and Kate Lynch have been selected as the principal narrators, and another eleven have been selected as narrators or speaking parts for particular scenes. Other parts are still being allocated, but those who expressed a preference to perform in particular scenes should hear in the next week. Those who said they were willing to take part in any scene will hear by mid-March, sooner if possible. 19/02/2010 - A fundraising evening entitled "A Fun Evening of indulgence & Relaxation" with Natural Therapies. Pampering & Demonstrations on Friday 12th March, Compton House, is announced in aid of the Axbridge Pageant. 17/02/2010 - The National Lottery Awards for All application has been successful. An award of £9544 has been made to support the costs associated with for Costumes & Props. 29/01/2010 - Weston & Somerset Mercury ran a brief article on the planning of the pageant & announced the Valentines Disco, to be held at theTown Hall on the 13th Feb.
28/01/2010 - Cheddar Valley Gazette reported the appointment of The Oak House Hotel as the pageant's principal sponsor. 25/01/2010 - Axbridge Pageant committee agrees proposal from The Oak House Hotel (www.theoakhousehotel..com) & they are announced as our Principal Sponsor. 25/01/2010 - The Pageant committe agreed that there will be a Victorian style 'photo booth' during the pageant week run by Barry Cawston & Soraya Schofield at The Drugstore Gallery, in Axbridge. 21/01/2010 - Axbridge Pageant's Artistic Director has been holding auditions for the Narrator(s) for this year's pageant. 04/12/2009 - Marian Nicholls generously loaned cuttings, programmes & photos from previous pageants to the current Masrketing team. She & her family have been in each of the pageants from it's start in 1967. 03/12/2009 - Cheddar Valley Gazette reported on the success of the Recruitment Day & the generous donations resulting from the Progressive Supper. 29/11/2009 - The Progressive Supper organisers Margaret & Paul Foulston gave a cheque for a massive £1400 to the Pageant committee. Allied to this, a cheque for £170 was gifted thanks to the raffle organised by Pauline Ham. Margaret, Pete Harding (Pageant Chairman) & Paul Hughes (Fundraising leader) as pictured. 29/11/2009 - The Pageant Recruitment Day was a massive success! Some 200+ people committed themselves to the 2010 Pageant. This added to the various Axbridge groups commitment gives the Pageant critical mass! 28/11/2009 - Juliet Maclay interviewed live on Simon Parkin's BBC Somerset Breakfast show. The interview focussed on the 2010 Pageant & the Recruitment Day on Sunday 29th November. Listen to it here! 25/11/2009 - Condensed Pageant video, by Katie Weir, released in time for the Pageant Recruitment day Sunday 29th November 2009. 21/11/2009 - Axbridge's Progressive Supper was a complete success, with many revellers returning to the Oak House for the raffle draw. With over 100 people taking part & generously supporting the raffle, we anticipate a large donation from the Progressive's organisers. 14/11/2009 - Pageant website gets a 'makeover' with a new sophisticated look. 13/11/2009 - Scanned images from the Millenium Pageant are made available, by John Kendall, & go online. More images to follow. 02/11/2009 - The Pageant committee submitted an application for the National Lottery "Awards for All" to raise money for Costumes & Props. 27/10/2009 - Cheddar Valley Gazette publishes story about Somerset Community Fund award of £1000 & how it will contribute to the biggest Axbridge Pageant ever. 27/10/2009 - Mendip Times publishes article by Juliet Maclay. "Stepping Back in Time" sets the scene for the 2010 Pageant. The article cites work underway now to prepare historically correct clothing for the large group of people expected to take part in the 2010 Axbridge Pageant Festival. 08/10/2009 - Somerset Community Foundation has agreed to provide £1000 funding towards the 2010 Pageant stage materials. 01/10/2009 - Cheddar Valley Gazette publishes pictures of the floats in the Axbridge Carnival, including a group shot of some of the Pageant's actors. 01/10/2009 - Western & Somerset Mercury publishes pictures of the floats in the Axbridge Carnival, including the prize winning Pageant float. 01/10/2009 - Catch This, the magzazine for the Axbridge, Shipham & Rowberrow parishes carries pictures of the Axbridge Carinval & an article entitled "What exactly is the Axbridge Pageant?". 28/09/2009 - Early Bird ticket sales extended till mid-November due to populartity. 20/09/2009 - A great collection of images & clipping from the 1967 & 1980 Pageants has been shared by Pheobe Edbrooke. Thanks to Paul Passey for scanning these. 07/09/2009 - It is confirmed that this year's Progressive supper will raise funds for the Axbridge 2010 Pageant Festival. 07/09/2009 - Pete Harding elected Chairman & John Kendall Vice Chairman of the Pageant Committe. 06/09/2009 - Early-Bird ticket sales extended till end of September. 15/08/2009 - A 2 week Pageant website poster campaign is run in Axbridge. Reduced price Early Bird tickets go on sale on the website's Box Office. These tickets are available for a short while only! 13/08/2009 - Cheddar Valley Gazette reports on new website, announcing a competition to win free tickets. This is open to online sales for the duration of a month. One winner to be picked at random. 27/07/2009 - Pageant committee meeting - Our chairman announces he is to stand down due to ill health. A change of leadership of Marketing group is announced. Plans for the Axbridge Carnival float are discussed. 04/07/2009 - Axbridge Fun Day, a firm fixture in the Axbridge diary entertained Axbridge residents & raised money for various good causes including the Axbridge Pageant Festival 2010. Thanks to the Sports & Social Committe for a great day & kind support. 15/06/2009 - new website goes live, ready for 2010 Pageant Ticket sales. 23/05/2009 - a fundraiser for the 2010 Pageant held at Axbridge Town Hall with local geezers 'The Stopcocks', fabulous SKA band 'Shoot The Moon' & '88 Straight' headlining was a great success. A good night had by all! Cheddar Ales "Potholer" went down well. Copyright © 2009 - 2010 Axbridge Pageant Festival 2010.